Explore the map of Georgia, which covers an area of 59,425 square miles and is the 24th most extensive state in the US. As of 2016, Georgia comprises a population of 10,310,371 residents. With a height of 1,458 meters, Brasstown Bald is the highest point in the state. The last of the original Thirteen Colonies, Georgia joined the Union on January 2, 1788. 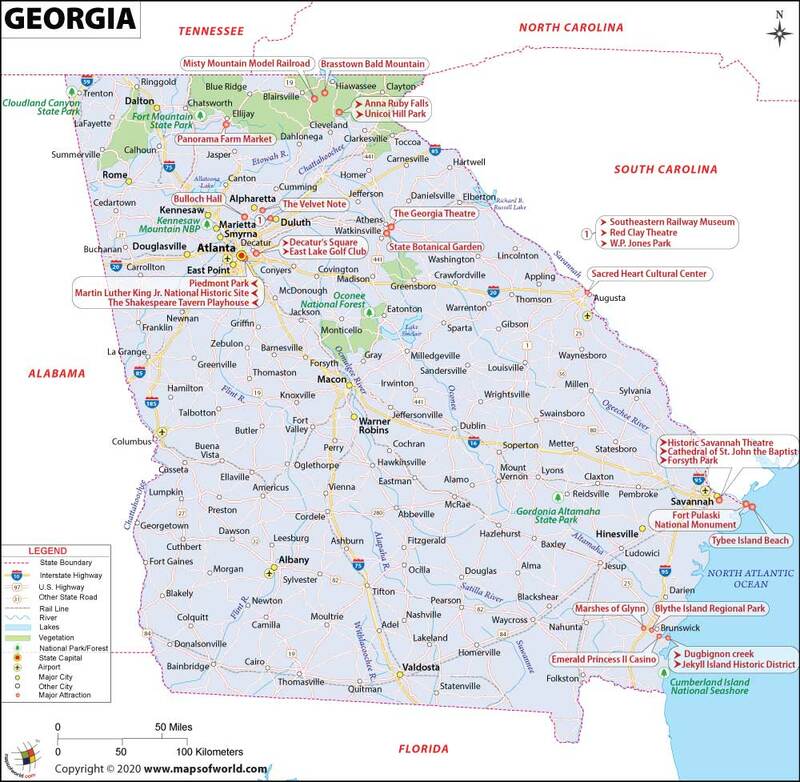 About Georgia Map: The map of Georgia depicts the location of the major cities and the capital city, Atlanta. Airports, rail lines, physical features, interstate highways, state boundary, major attractions etc are also shown on the map. The official flag of Georgia has two red stripes and one white stripe. There is a blue region in the upper left corner that has the state coat of arms. Long before the arrival of the Europeans in the 18th century, Georgia was inhabited by people belonging to the Mound Building cultures. However, the state came into contact with the Europeans for the first time on February 12, 1733, when James Oglethorpe founded it as a British colony. During the War of Jenkins' Ear, the Spanish invaded Georgia in 1742. In 1752, Georgia became a crown colony and was administered by a governor appointed by the king. Georgia played a pivotal role in the American Revolution and was one of the 13 colonies that revolted against the British rule in the country. A big moment in the history of Georgia came in 1829 when gold was found in the North Georgia mountains. This spectacular discovery resulted in the Georgia Gold Rush. The state also played a prominent role in the Civil War that had engulfed the country in the mid 19th century. Georgia had joined the Confederacy in early 1861. It was restored to the Union in 1870. Situated in the southeastern part of the country, Georgia covers an area of 59,425 square miles. Georgia shares its borders with Alabama, Florida, North Carolina, South Carolina, and Tennessee. Georgia has various flora and faunas. It is estimated that around 250 tree species and some 58 protected plants exist in the state. Some of the state's native trees are red cedar, hollies, oaks, cypress, sweetgum, etc. Though White-tailed deer can be spotted in abundance, Georgia makes a perfect spot for a variety of birds and animals, such as northern mockingbird, brown thrasher, salamanders, frogs, alligators, toads, whales, blue crabs, oysters, among others. Most parts of the state basically experience a humid subtropical climate, where summers are mostly hot and humid. Standing at 1,458 meters above mean sea level, Brasstown Bald is the highest mountain in Georgia. Some other prominent mountains in the state are Rabun Bald, Arabia Mountain, Big Bald Mountain, Black Mountain, and Blood Mountain. Major rivers that run through the state are Altamaha River, the Savannah River, and the Suwannee River. Know more here..
Georgia is a marvelous destination and every year thousands of tourists from around the world visit the state to experience its many attractions. Situated in the city of Atlanta is the Martin Luther King Jr. National Historic Site. Martin Luther was the tallest leader of the US civil rights movement and this is where he was born and where he rests peacefully. Situated in the Plains is the Jimmy Carter National Historic Site. Here, visitors can catch a glimpse of the former president's boyhood home and farm among others. Known as the "millionaires island", Jekyll Island is a popular tourist attraction. The Chattahoochee National Forest is perfect for sightseeing, hiking, camping, and much more. Some other prominent attractions in the state include Callaway Gardens, Ocmulgee National Monument, Forsyth Park, and Okefenokee Swamp to name a few. Hartsfield–Jackson Atlanta International Airport is the most prominent airport in the state and is located in Atlanta. It is situated approximately 8 miles south of downtown and since 1998, it has been the world's busiest airport. MARTA or the Metropolitan Atlanta Rapid Transit Authority is the main rapid transit system that operates in the Atlanta metropolitan area. There are over 70 public colleges, universities, and technical colleges in the state, with 45 institutions of private higher learning. The oldest public university in the US is located in Georgia - The University of Georgia - with a highly rated research program. Georgia is also home to Berry College in the city of Rome, which contains the largest college campus in the world. Georgia is the leading producer of peanuts, pecans, and peaches in the US. Coca-Cola was invented in Atlanta, Georgia.